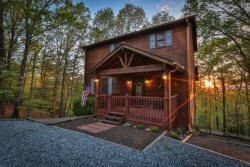 Mountain Oasis Cabin Rentals is located in Ellijay, GA just 90 minutes North of Atlanta, GA, 90 minutes East of Chattanooga, TN and 2 hours South of Knoxville, TN. We are located at 14224 Hwy 515 N Suite #200 Ellijay, GA in Whitepath Commons Shopping Center, next door to Satterwhite Log Homes. Drop by and see us while you're here. We love to have visitors!